Congratulations to our collaborative learners this week! Literacy: We will be looking at non-chronological texts and discussing the features. Reading: We will be reading a variety of short texts and answering some comprehension questions. Maths: We will be consolidating our knowledge of the four operations; addition, subtraction, multiplication and division. Project: This week we will be doing some Under the Sea artwork, planting some seeds and the Science Dome is coming to visit! Literacy: We will be writing our own instructions about feeding, looking after and taking care of different creatures. Maths: We will be learning about measuring. We will be thinking about different types of measuring and recognising which type is suitable for different occasions. Project: This week, to finish our topic, the children are going to be designing and making their own towns in small groups. Literacy: We will be continuing to think about instruction writing using a text called 'How to Trap a Dragon'. We will be writing our own instructions on how to trap a different character. Project: This week is art week! We will be exploring the work of the artist Anthony Caro and using his own ideas to create our own art work. Please could you bring in any junk modelling materials you can find at home. We are looking for a variety of things, but particularly cardboard boxes of all sizes! Literacy: We will be learning about instruction writing. We will be looking at a text called 'How to Trap a Dragon'. Maths: We will be learning about position and movement including; forwards, backwards, left, right, half turns, quarter turns and three quarter turns. Project: We will be learning about the history of Redhill and investigating the changes there have been to the town over time. Literacy: We will be using what we have learnt about journey stories and descriptive writing (through Meerkat Mail) to write some diary entries. Maths: We will be continuing with data handling, including looking at block diagrams and interpreting the data. Project: We will be continuing to look at the work of the artist Lowry and creating some big art work using his ideas and thinking about perspective. Literacy: We will be identifying features of descriptive writing, for example, adding detail through the use of conjunctions and using description to make writing more interesting. Project: We will be looking at the work of the artist Lowry and creating our own versions. We will also be thinking about our favourite books on World Book Day! On the day that your child is taking part please can you make sure they have their bike, scooter or tricycle in school as well as a helmet. They also need to wear their PE kit on this day. We will be celebrating World Book Day on Thursday 7th March 2019. The theme this year is ‘Sharing a Story’ and we will be inviting children to come to school onThursday 7th March dressed as a character from a book. If you need help with ideas for costumes please speak to your class teacher. Literacy: We will be writing our own non-fiction text about 'Learning at Earlswood' using the features of information writing. Maths: We will be learning about fractions of numbers, including 1/2, 1/3, 2/3, 1/4, 2/4, and 3/4. Project: We will be identifying the importance of exercise for humans and recording and performing our own 5-A-Day routines. Literacy: We will be writing our own non-fiction text about sports using the features of information writing. Maths: We will be learning about fractions of shapes, including 1/2, 1/3, 2/3, 1/4, 2/4, and 3/4. Project: We will be identifying the importance of exercise for humans and choreographing our own 5-A-Day routines. Literacy: We will be learning a non-fiction text about a sports and starting to think about the features of information writing. Maths: We will be looking at naming and recognising the properties of 2D and 3D shapes. Project: We will be identifying the importance of exercise for humans and researching famous sports people. Literacy: We will be writing our own wishing tales this week using the toolkit for writing a wishing tale. Maths: We will be looking at naming and recognising the properties of 3D shapes . Project: The children will be completing their board games. Literacy: We will be writing our own versions of Wanda Wallaby Finds Her Bounce using the toolkit for writing a wishing tale. Maths: We will be continuing to think about money. We will be adding and subtracting amounts, including working out change. Project: The children will be designing and making their own board games as well as completing a crater investigation in science. Literacy: We will be continuing to learn the wishing tale called Wanda Wallaby Finds Her Bounce. We will be looking at the toolkit for writing a wishing tale and exploring the features of the text. Maths: We will be continuing to think about money. We will be adding amounts and finding different ways of making the same amount with coins. Project: The children will be designing and completing their own investigations around using different balls and recording their results. Due to unforeseen circumstances the Zumba workshops planning for Monday 7th January have been moved to Wednesday 9th January. If you would like to send you child into school wearing their PE kit on this day you are welcome to. Happy New Year! We hope you have all had a lovely break and we are excited to welcome the children back to school. Maths: We will be looking at money and recognising coins. We will also be answering some different maths questions around money. Project: We will be starting our new topic Bounce! Literacy: We will be looking at the structure of a wishing tale and having a go at writing one with our own ideas. Maths: We will be looking at money and recognising coins. We will also be doing some maths investigations. Project: We will be evaluating our instruments that we made last week. Unfortunately next week we are saying goodbye to the lovely Miss Cox who has been working in Honeybee class, as she is going to be spending more time with her young family. From January, Miss Bond will be based in Honeybee class with Miss Porto and we are welcoming Miss Thompson who will join Froghopper class with Miss Capstick. Literacy: We will be writing our own finding tales using our own ideas. We will be focussing on creating really good setting descriptions within their stories. Maths: We will be learning about multiplication and division fact families. Project: We will be making our own instruments that we designed last week. Literacy: We will be writing our own version of 'The Bear and the Piano', focusing on the different features of finding tales. Maths: We will be learning to double and halve numbers up to twenty, using multiplication and division facts. Project: We will be performing our Nativity and designing our own instruments. Towards the end of the autumn term, the children will be making their own instruments using junk modelling. If you are able to bring any materials in from home they would be greatly appreciated, thank you! Please bring your change of clothes in a named bag ready to change into after lunchtime. ALL children to arrive at school at 5.30pm. Children to be dropped off at at the following reception classroom doors. After the performance, please collect your child from the same classroom door. Literacy: We will be looking at the different features of finding tales and developing some setting and character description skills. Maths: We will be learning about the relationship between multiplication and division for the 2, 3, 5 and 10 times tables. Project: We will be doing lots of rehearsals for our Nativity performances and designing programmes. Literacy: We will be learning the story of The Bear and the Piano and looking at the features of finding tales. Maths: We will be learning to recall and use division facts for the 2, 3, 5 and 10 times tables. Project: We will be doing some artwork based on pictures from the story The Bear and the Piano. Literacy: We will be using all of the things we have learnt about persuasive writing to write letters asking people to come to the Nativity performances. Reading: We will be reading Tyrannosaurus Drip by Julia Donaldson and answering questions based on the text. Maths: We will be learning to recall and use multiplication facts for the 2, 3, 5 and 10 times tables. Project: We will be investigating putting water in jars and seeing the sounds that are made and comparing music from different countries. Literacy: We will be adapting part of the story The Day the Crayons Quit to write our own letters. We will be using persuasive writing text features. Reading: We will be reading Patrick by Quentin Blake and answering questions based on the text. Maths: We will be looking at the relationship between addition and subtraction and using what we know to solve missing number questions. Project: It is science week so we will be doing lots of different investigations into how different materials change, for example, by melting. Literacy: We will be learning part of the story The Day the Crayons Quit and looking at the different text features. Reading: We will be reading The Musical Life of Gustav Mole and answering questions based on the text. Maths: We will be learning about subtracting two two-digit numbers using concrete and pictorial representations as well as subtracting numbers mentally. Project: We will be listening to and comparing lots of different types of music and doing some expressive art to music. We have had some more mystery readers this week, which the children have really enjoyed! Thank you to those of you that have come to read to the classes. If this is something you would like to do, or if you know anybody who would be interested in this, please contact your child's class teacher. Literacy: We will be learning about the different word classes (nouns, verbs, adverbs and adjectives). Reading: We will reading George's Marvellous Medicine and answering questions based on the text. Maths: We will be learning about subtracting numbers using concrete and pictorial representations as well as subtracting numbers mentally. Project: We will be using lots of different resources to create our own art pieces to finish off our topic. On Wednesday 17th October you are invited to visit your child's classroom after school to see the work they have done in Year 2 so far. We hope to see lots of you there! Literacy: We will be writing our own recounts about something we have done. Maths: We will be continuing to add numbers using concrete and pictorial representations as well as adding numbers mentally. We will also be using our knowledge of addition to solve word problems. Project: We will be thinking about how different materials can be changes. We will also be looking at collages by famous artists, then designing, making and evaluating our own collages. We have had three mystery readers this week, which the children have really enjoyed! Thank you to those of you that have come to read to the classes. Literacy: We will be writing our own recounts of our Messy Morning using descriptive words and phrases. Maths: We will be adding numbers using concrete and pictorial representations as well as adding numbers mentally. Project: We will be looking at artwork by Henri Rousseau and Henri Matisse and using their ideas to create our own art pieces. We are looking for 'mystery readers' to come into class and read a short book to the children. If this is something you would like to do, or if you know anybody who would be interested in this, please contact your child's class teacher. Literacy: We will be discussing ideas and planning for writing our recounts of our Messy Morning. Maths: We will be using place value and number facts to solve number problems. We will also be counting 2, 3, 5 and 10 from 0. Project: We will be talking about online safety and making some art work using string printing. Literacy: We will be writing our own adapted versions of The Naughty Bus. 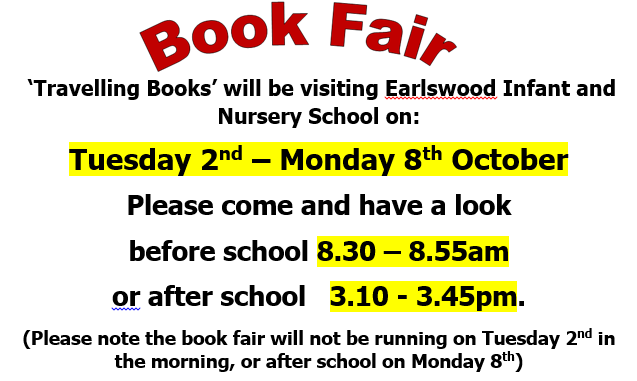 Reading: We will be looking at a range of picture books and answering questions based around the pictures. Maths: We will be comparing and ordering numbers from 0 to 100 using <, > and = signs. Project: We will be using our primary and secondary colours skills to create some artwork. We will also be looking at some artwork by Kandinsky and using his ideas to create our own art pieces. Your child will have brought home a green spelling book. This is to be used to practice their spellings and then needs to be brought back into school every Thursday for their spelling quiz. Their new spellings will then be stuck in and the books will be given back to the children on Fridays. Literacy: We will be reading and learning the story of The Naughty Bus. Reading: We will be reading The Messy Magpie together and answering questions about the text. Maths: We will be practising our knowledge of place value, including identifying, representing and estimating numbers in different ways. Project: We will be looking at primary and secondary colours then using those skills to create our own colour charts. We will also be having our Messy Morning. On Thursday 13th September we will be having our Messy Morning. This will involve exploring different messy materials. Please can your child come to school in old clothes that you do not mind getting dirty. They will need to bring their PE kit to school to change into for the afternoon. Literacy: We will talking, drawing and writing about some of the exciting things that we did over the holidays. Reading: We will be reading a variety of books together, the teachers and children will be listening to each other read. Maths: We will be practising our knowledge of place value and playing some games using different resources. Project: We will be starting our new topic Muck, Mess and Mixtures which will include exploring lots of different materials and creating a range of artwork. We hope you've all enjoyed the holidays and are looking forward to starting Year 2, the staff are all very excited to get to know their new classes. The Year 2 PE days are Tuesdays and Fridays so please can your children wear PE kits and trainers on these days. Please also tie long hair back and remove earrings. We will be going to the juniors every Friday for our Music and Cooking/Woodlands lessons. The children will need a pair of wellies and a waterproof coat every Friday. We will be sending home reading books which will be changed on a Tuesday and Thursday. 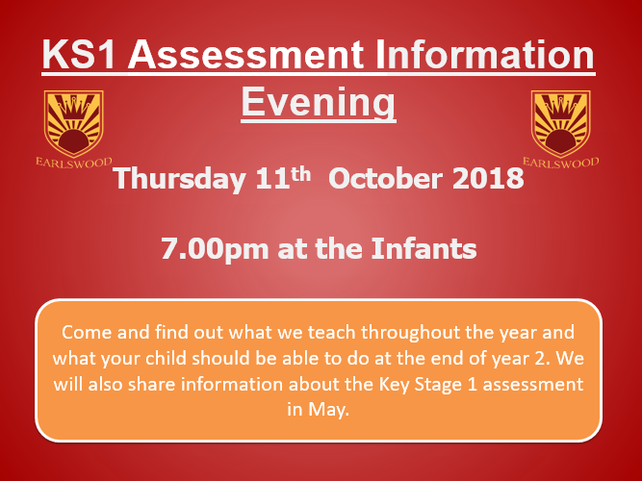 If you have any questions please come and speak to your child's class teacher!